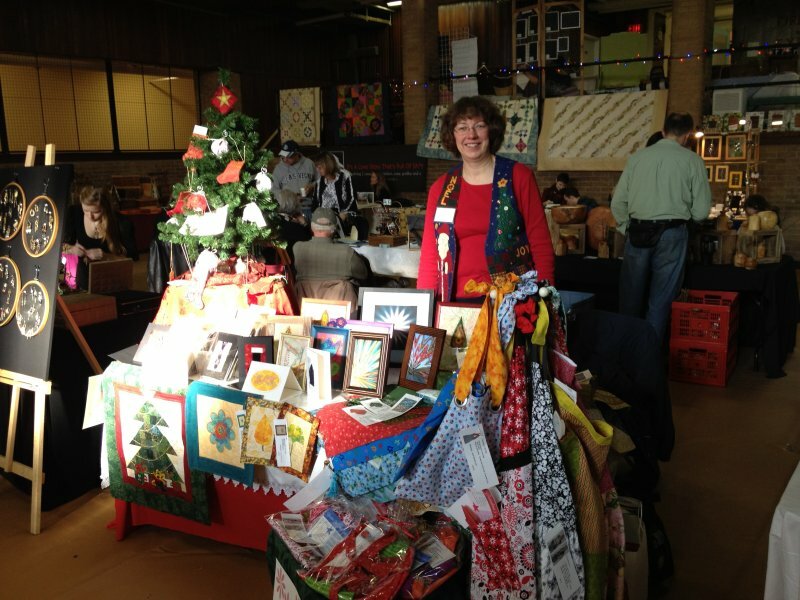 The East Toronto Club Arts and Craft Show on Saturday was a great experience. I met some wonderful people, made some sales, got a feel for the business of crafting and got a lead for another show this weekend that I’ll be participating in. The “Holiday in the Hood” sale will be at Earl Beatty School, 55 Woodington Ave. near Coxwell and Danforth in Toronto on Friday from 3:30pm to 8pm and Saturday from 9am to 1pm. There will be a great variety of items at that sale, too! I’m not sure whether I’ll be ahead after it – I can see a bunch of things I’d like to get for Christmas gifts (and for me)! My daughter helped me at the East Toronto Rotary sale. She was a great model for my aprons, and the ones that were the same style as the one she wore sold out. This was one I made in Chrismas fabrics. It’s completely reversibe, with the green fabric on the other side. At the sale, she wore the one I made for her last Easter. We didn’t sell that one! I’ll try to get a couple more made for this weekend. 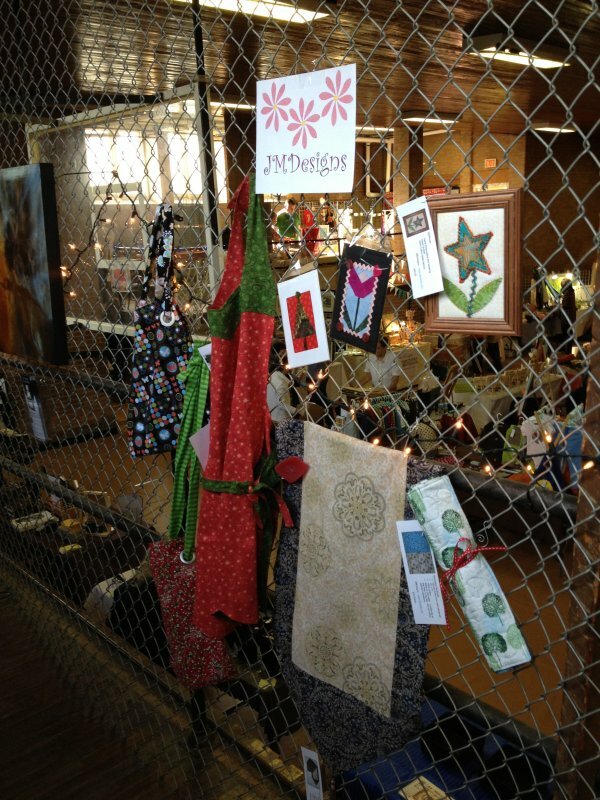 This entry was posted in Craft Shows and tagged Toronto East Rotary Club Craft Sale. Bookmark the permalink. I wanted to answer to the two comments you left on my blog (for the Blogathon Canada) but you are a no-reply blogger so I can’t so I’m going to do this hear ok ? 2nd : you are so lucky you are able to do craft fair ! I would love to but I think it’s not a very popular thing here in Quebec.. maybe I’m not looking at the right places though. JM I wonder is there a pattern for this apron? I made an apron with some fun fabric a couple of years ago only to find it didn’t fit me properly – the straps kept falling off my shoulders which is not very helpful when you are up to your armpits in cooking. It looks like your apron design avoids this problem. I adapted it to make scallops at the hem rather than the points (I found they fitted together at the sides better), and when I made the last two, I made longer ties at the neck so they could be tied rather than the Velcro closure that the pattern called for. When my daughter wears her apron, she ends up tying the neck straps since the Velcro placement as per the pattern makes the neck too loose. I’m not sure if you can see it in the photo here:https://www.etsy.com/transaction/108636900 (the 4th photo down).